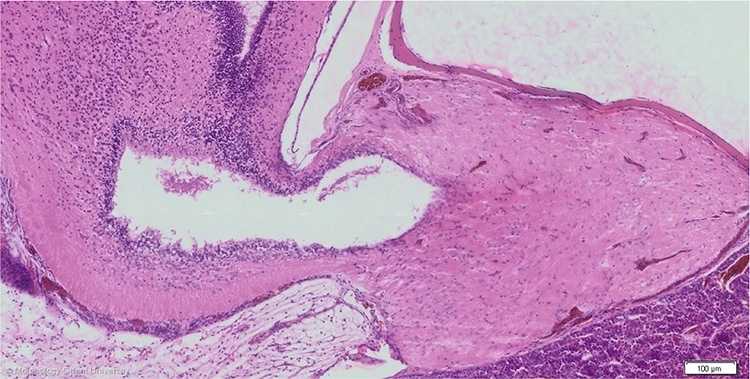 The pars tuberalis proper forms two lateral sheaths on the surface of the median eminence and the infundibular stem of the neurophypophysis that can fuse caudally, subjected to individual variations. The sheaths can extend anteriorly on the ventral surface of the brain to the region of the optic chiasm and can laterally extend up onto the diencephalon. Close to the pars caudalis, the sheaths of the pars tuberalis proper fuse to form a complete collar, porto-tuberal tract called. Within this portal zone run the portal vessels that connect the primary capillary network of the median eminence with the secondary network of the anterior lobe. Strings of chromophobic cells that extend downwards from the pars tuberalis proper on each side between the cephalic and caudal lobe form the pars tuberalis interna.